A tooth that is cracked can be painful. It also can lead to disease of the tooth. How Can You Tell if Your Tooth is Cracked? It can be hard for you to tell if a tooth is cracked. If you have pain, you may not be able to tell which tooth hurts or even whether the pain comes from the top or bottom of your mouth. Cracks may be invisible to the eye and may not even show on an x-ray. And sometimes you won't have any pain or sensitivity at all; your dentist will discover it during your exam. Why Does Your Tooth Crack? Why Does Your Cracked Tooth Hurt? Pulp is the soft tissue inside the center of your tooth and contains nerves and blood vessels. If the crack reaches the pulp, your tooth may be sensitive to hot and cold. Sometimes, a crack in the enamel of your tooth goes all the way down to the nerve pulp. This type of cracked tooth may hurt when you bite down or when you stop biting. The crack may be too small to see but is large enough for the pulp inside your tooth to become irritated. When your tooth is cracked, the pulp sometimes becomes infected. If this happens, treatment to remove the pulp, also known as a root canal, may be needed to save your tooth. 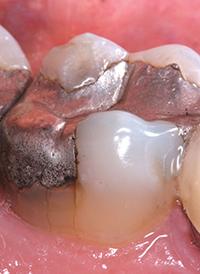 How is Your Cracked Tooth Treated? Treatment depends on the size, location and direction of the crack, as well as your symptoms. It is possible that your dentist will recommend no treatment at all, since tiny cracks are common and usually do not cause problems. 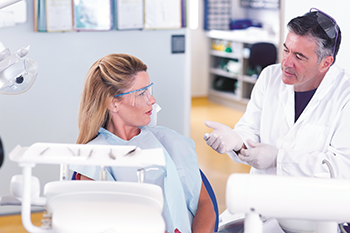 You and your dentist can talk about the types of treatments for your tooth and decide on the treatment that is right for you. Regular dental checkups are important, because they let your dentist find and treat problems at an early stage. A cracked tooth can become a bigger problem if left untreated. If you think you may have a cracked tooth, visit your dentist. Photo of cracked tooth with large filling captured by Dr. Joseph Nelson II.